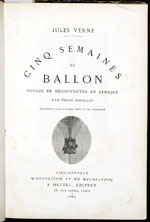 The Smithsonian Institution Libraries are fortunate to have a few early editions of Verne's works with the original engraved illustrations which made his works so popular. 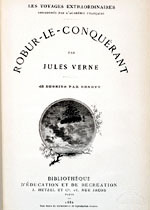 Verne and his publisher Julius Hetzel paid acute attention to the details of these illustrations, so that they are almost an integral part of the story. 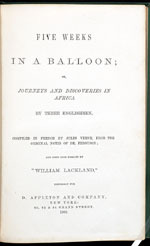 Later reprints usually omitted these engravings, and since the original woodcuts and early printing plates are long gone, all that remains are these images from the early books. 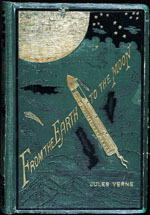 The following selection will give an idea of what was available one hundred years ago - illustrations which introduce the characters, provide panoramas which describe the locale of the adventure and the flora and fauna encountered, give maps where the reader may follow the heroes' adventures, or illustrate a particularly exciting or scientific moment. 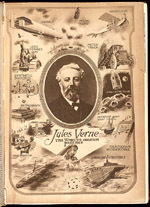 They are truly Voyages Extraordinaire.